Simethicone is Over the counter – OTC drug which is chemically a mixture of polydimethylsiloxane and hydrated silica gel. Simethicone was approved by the FDA in 1952. as a gas relief treatment. This antifoaming agent is use for the treatment of gas symptoms which may cause painful pressure, fullness, and bloating in gastrointestinal tract. This is also not only use of simethicone. It can be also used as a diagnostic agent and many health professionals often give simethicone to patients before an abdominal ultrasound examination. Simethicone has antifoaming properties that can help visual obstructions that are caused by intestinal gas to be reduced. By the way, it can be also added to laundry detergents to prevent excess foam production. It is available in many pharmaceutical dosage forms such as: tablet, chewable tablet, capsule, gel capsule, liquid and dissolving membrane forms. Simethicone for oral use is most commonly formulated as capsules of 125 mg and 180 mg, chewable tablets of 40 mg, 80 mg and 125 mg, and liquid drops of 40 mg/0.6 ml. What are common Brand names for Simethicone? Micon-80, Mylanta Gas and others. 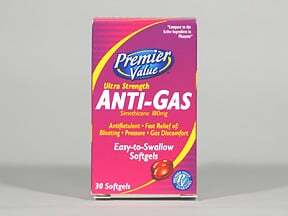 Simethicone does not work as many other gas relievers by preventing the forming of gas formation or by reducing the amounts of existing gas in intestinal tract. Simethicone works by causing smaller bubbles of gas to merge into larger ones, which may pass faster through intestines with less discomforts comparing to series of small bubbles. How long does Simethicone take to start working? Usually simethicone start working after 15-20 minutes. How long does Simethicone stay in your system? Simethicone is not absorbed into bloodstream and do not have distribution in the body. It passes only through the gastrointestinal tract. There are no pharmacokinetic data about simethicone half-life time. Usually, simethicone will stay in the body for not more than a day. However some individual factors such as: gastrointestinal health, gastrointestinal motility, digestive disorders, other medicines used at the same time and etc. Does Simethicone cause any side effect? Simethicone does not cause any side effects if it is taken as directed, because it is not absorbed into bloodstream and all drug is eliminated through the feces. Loose stools can be actually only side effect that this medicine may cause. If this drug is overdosed mild diarrhea, nausea, regurgitation, and vomiting may occur. However, patients should tell their doctor if they experience any unusual symptoms. This medicine should be taken by mouth. Capsules should be swallowed with a full glass of water, while tablets or chewable tablets should be crushed or chew before use. It is important that you chew the tablets fully before you swallow them. This is to allow simethicone to work faster and more completely. 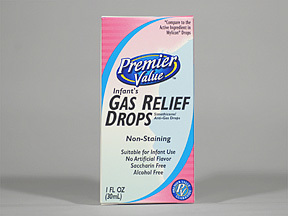 Simethicone drops are also used in infants with colic to reduce gas bubbles in the intestines. This drug is generally considered safe for newborns and babies. Simethicone drops (suspension) should be shaked well before using and may mix with 30 mL water, infant formula, or other liquids. Simethicone should be stored at 20°C to 25°C and protected from moisture. High humidity and excessive heat have to be avoided. How much Simethicone should I take? Children older than 6 years of age and adults should take 2 tablets or capsules of 40mg of simethicone 3-4 times a day, after meals and at a bedtime. Maximum daily dose of 500mg/day should not be exceeded. There is not enough data and relevant studies to establish simethicone safety during pregnancy. In fact, FDA has not assigned formally any simethicone drug classification. However, it is known that simethicone can’t be absorbed into bloodstream so it could not cross placenta. This is why some resources consider that it is probably compatible with pregnancy. More well-controlled studies are required to establish its safety. Because of the lack of data about simethicone administration during pregnancy, the manufacturer recommends that the drug be used by pregnant women only when the benefit outweighs the risk. Patients should tell their doctor if they plan to become pregnant or are pregnant before start using simethicone. If you become pregnant while taking this drug, consult your doctor right away. You will need to discuss the potential risks and benefits of the drug with your healthcare provider. There are no available studies about safety of simethicone use while breastfeeding. However, it is thought that this medication can’t be absorbed into bloodstream after oral use so that is why it is unlikely to be excreted into the breast milk. Furthermore, simethicone drops is safely used in newborns without any side effects or untoward reports. However, studies are required to be sure that simethicone, does not have any side effects on infants as well as its possible side effects on lactation. It is always the best option to consult your doctor first before taking this drug. Before taking simethicone, patients should tell their doctor if they are allergic to any drugs or if you have any type of serious illness. Patients should never use more than the recommended dose of simethicone. Patients should ask theirr doctor before using antacids while taking simethicone. This drug is found in many combination products, and taking these medicines together may cause you to consume too much simethicone. Can I take Simethicone and Levothyroxine together? Patients should avoid taking simethicone and levothyroxine together. Simethicone may interfere with levothyroxine absorption and lower its effectiveness. The exact mechanism of this interaction is still unknown but may involve adsorption of levothyroxine to polyvalent cations, and thus forming an insoluble complex that is poorly absorbed from the gastrointestinal tract. To prevent or minimize the probability of interaction, these drugs should be taken at least 4 hours apart. Patients should call their doctor if they experience symptoms and signs of reduced thyroid function such as: fatigue; constipation; depression; sluggishness; unexplained weight gain; hoarseness; pale, dry skin; sensitivity to cold; muscle aches, weakness, or tenderness; swelling; joint pain, stiffness, heavier than normal menstruation periods.